This research presents a hypotheticalmodel regarding university students’ perceptions of their current preparation for entering the workforce that uses a structural regression model to connect various aspects regarding training, satisfaction, information, and career guidance programs. Its research objectives are to establish the goodness of fit of the model, analyse the relationships established among the variables, and compare the effect of career guidance on these variables. To this end, a representative sample of 931 final year undergraduate students from the Universidad de Murcia and the Universidad de Granada from a range of degrees and branches of knowledge participated anonymously and voluntarily by completing an ad hoc questionnaire (named COIL). The AMOS v21 program was used to analyse the data and estimate the relationships established among the different variables of the model. Elevated model fit indexes stand out among the main results obtained, corroborating its design using the empirical data, as well as statistically significant causal relations in all cases analysed. In addition, introducing participation in professional guidance programs as a grouping variable strengthens these causal relationships. These results emphasize the role of career guidance as a key connection between higher education and employment at a time of change and transition to the workforce for university students where difficulties are not measured by the benefits achieved but rather by the permanent configuration of the changing and ambiguous social context in which they must make this transition. Allen, J., Ramaeker, G., & Van Der Velden, R. (2003). La medición de las competencias de los titulados superiores. In J. Vidal (Coord. ), Métodos de análisis de la Inserción Laboral de los Universitarios (pp. 31-54). Salamanca: Kadmos. Alcoforado, L. (2013). Estrategias, retos y recursos para los orientadores en el escenario de la educación y la formación a lo largo de la vida. In P. Figuera (Coord. ), Orientación Profesional y Transiciones en el Mundo Laboral. Innovaciones en orientación sistémica y en gestión personal de la carrera (pp. 21-50). Barcelona: Laertes. Auberni, S. (1995). La orientación profesional. Barcelona: Institut Municipal d’educació. and meaning of transitions in the context of dual sector FE/HE institutions in England. Journal of Further and Higher Education, 33 (2), 119-130. Bazán, A., Sánchez, B., Corral, V., & Castañeda, S. (2006). Utilidad de los modelos estructurales en el estudio de la lectura y la escritura. Revista Interamericana de Psicología, 40, 85-93. Bennett, N., & Lemoine, G. (2014). What VUCA really means for you. Harvard Business Review, 92 (1/2). Retrieved from https://ssrn.com/abstract=2389563 (Consulted on March 12, 2017). Bridgstock, R. (2009). The graduate attributes we've overlooked: enhancing graduate employability through career management skills. Higher Education Research & Development, 28 (1), 31-44. Brown, P., Hesketh, A., & Williams, S. (2002). Employability in a knowledge-driven economy. In P. Knight (Ed. ), Notes from the 13th June 2002 ‘Skills plus’ conference, Innovation in education for employability held at Manchester Metropolitan University (pp. 5-25). Retrieved from http://www.open.ac.uk/vqportal/Skills-Plus/documents/13%20June.pdf (Consulted on February 22, 2017). Browne, M. W., & Cudeck, R. (1993). Alternative ways of assessing model fit. In K. A. Bollen & J. S. Long, (Eds. ), Testing Structural Equation Models (pp. 136-162). Beverly Hills, USA: Sage. Conchado, A., & Carot, J. (2013). Puntos fuertes y débiles en la formación por competencias. Revista de Docencia Universitaria, 11 (1), 429-446. Cupani, M. (2012). Análisis de ecuaciones estructurales: conceptos, etapas de desarrollo y un ejemplo de aplicación. Revista Tesis, 1, 186-199. Dobrea, R. C., & Staiculescu, C. (2016). Next manager. Academic Background versus Labor Market Requirements. Risk in Contemporary Economy, 244-252. Figuera, P. (1996). La inserción socio-profesional del universitario/a. Barcelona: Ediciones Universidad de Barcelona. Forrier, A., & Sels, L. (2003). The concept employability: a complex mosaic. Human Resources Development and Management, 3 (2), 102-124. Freire, M. J., Teijeiro, M. M., & Pais, C. (2013). La adecuación entre las competencias adquiridas por los graduados y las requeridas por los empresarios. Revista de Educación, 362, 13-41. Freire Seoane, M. J. (2007). Competencias profesionales de los universitarios. Consello Social Universidade da Coruña, Universidade da Coruña. Fugate, M., Kinicki, A. J., & Ashforth, B. E. (2004). Employability: A psycho-social construct, its dimensions, and applications. Journal of Vocational Behavior, 65, 14-38. Gamboa, J. P., Lerin, F. J., Ripoll, P., & Peiró. J. M. (2007). La empleabilidad y la iniciativa personal como antecedentes de la satisfacción laboral. Documentos de trabajo: Serie EC (Instituto Valenciano de Investigaciones Económicas), 1. González Zamora, M. M., & Sanchís Pedregosa, C. (2014). Satisfacción de los egresados con la formación recibida en el Máster de Estudios Avanzados en Dirección de Empresas. Revista de Educación en Contabilidad, Finanzas y Administración de Empresas, 5, 33-48. Harris, R., & Rainey, L. (2012). Learning pathways between and within vocational and higher education: Towards a typology? Australian Educational Researcher, 39, 107-123. Hartshorn, C., & Sear, L. (2005). Employability and Enterprise: Evidence from the North East. Urban Studies, 42 (2), 271-283. Hemingway, A., & Marquart, J. (2013). Uncertainty is opportunity: Engage with purpose. Edelman. Retrieved from https://www.edelman.com/post/uncertainty-is-opportunity-engage-with-purpose/ (Consulted on April 2, 2017). Hogan, R., Chamorro-Premuzic, T., & Kaiser, R. B. (2013). Employability and Career Success: Bridging the Gap Between Theory and Reality. Industrial and Organizational Psychology, 6, 3-16. Hu, L., & Bentler, P. M. (1999). Cutoff criteria for fit indexes in covariance structure analysis: Conventional criteria versus new alternatives. Structural Equation Modeling, 6, 1-55. Humburg, M., & Van der Velden, R. (2015). Skills and the graduate recruitment process: Evidence from two discrete choice experiments. Economics of Education Review, 49, 24-41. Kline, R. B. (1998). Principles and Practice of Structural Equation Modeling. New York, USA: The Guilford Press. Knight, P., & Yorke, M. (2004). Learning, Curriculum and Employability in Higher Education. London: Routledge Falmer. Koys, D. J. (2017). Using the Department of Labor’s «My Next Move» to Improve Career Preparedness. Journal of Management Education, 41 (1), 94-117. Lantarón, B. S. (2014). La empleabilidad en la Universidad Española. Journal for Educators, Teachers and Trainers, 5 (2), 272-286. Lent, R. W., & Brown, S. T. (2013). Social Cognitive Model of Career Self-Management: Toward a Unifying View of Adaptive Career Behavior Across the Life Span. Journal of Counseling Psychology, 60 (4), 557-568. Longhi, S., & Taylor, M. (2011). Explaining differences in job search outcomes between employed and unemployed job seekers. IZA Discussion Paper, 5860, 1-29. Martínez Clares, P., & González Lorente, C. (2018). Validez de contenido y consistencia interna de un cuestionario sobre el proceso de inserción socio-laboral desde la mirada del universitario. Revista Complutense de Educación, 29 (3), 33-50. Moreau, M., & Leathhwood, C. (2006). Graduates’ employment and the discourse of employability: a critical analysis. Journal of Education and Work, 19 (4), 305-324. OCDE (2016). Panorama de la educación 2016. Indicadores de la OCDE. Madrid: Fundación Santillana. Oliver, A., Tomás, J. M., Hontangas, P. M., Cheyne, A., & Cox, S. J. (1999). Efectos del error de medida aleatorio en modelos de ecuaciones estructurales con y sin variables latentes. Psicológica, 20, 41-55. Popovic, C., & Tomas, C. (2009). Creating future proof graduates. Assessment, Learning and Teaching Journal, 5, 37-39. Raybould, J., & Sheedy, V. (2005). Are Graduates Equipped with the Right Skills in the Employability Stakes? Industrial and Commercial Training, 37 (5), 259-263. Robinson, N. K., Meyer, D., Prince, J. P., McLean, C., & Low, R. (2000). Mining the internet for career information: A model approach for co llege students. Journal of Career Assessment, 8, 37-54. 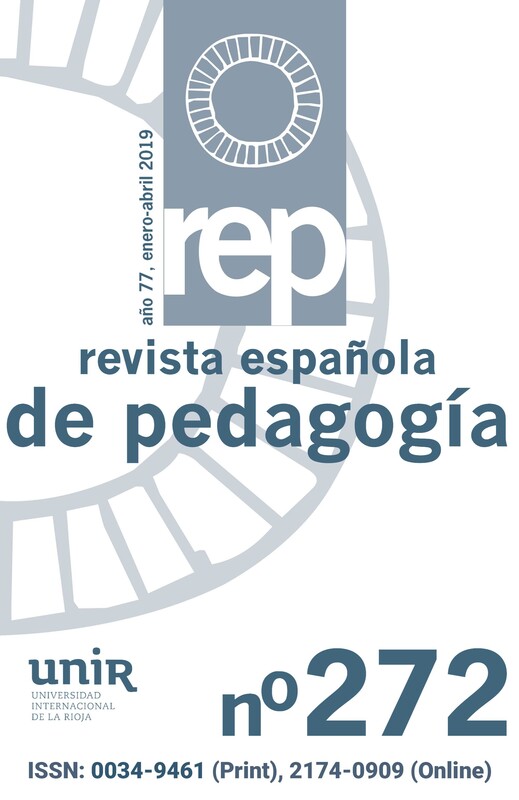 Rodríguez Espinar, S., Prades, A., Bernáldez, L., & Sánchez, S. (2010). Sobre la empleabilidad de los graduados universitarios en Catalunya: del diagnóstico a la acción. Revista de Educación, 351, 107-137. Rodríguez, S., Prades, A., & Basart, A. (2007). Accions per facilitar la inserció laboral. In A.
Serra (Ed. ), Educació superior i treball a Catalunya (pp. 329-368). Barcelona: Agència per a la Qualitat del Sistema Universitari de Catalunya (AQU). Rothwell, A., & Arnold, J. (2007). Self-perceived employability: development and validation of a scale. Personnel Review, 36 (1), 23-41. Ruiz M. A., Pardo A. y San Martín, R. (2010). Modelos de ecuaciones estructurales. Papeles del Psicólogo, 31, 34-45. Salas, M. (2003). Educación superior y mercado de trabajo. Granada: Grupo Editorial Universitario. Santana Vega, L. (2010). La transición a la vida activa. Revista de Educación, 351, 15-21. Savickas, M. L. (2005). The theory and practice of career construction. In S. D. Brown & R. W. Lent (Eds. ), Career Development and Counseling: Putting theory and research to work (pp. 42-70). New Jersey, USA: John Wiley & Sons, Inc.
Sirgy, M. J., Grezeskowiak, S., & Rahtz, D. (2007). Quality of College Life (QCL) of Students: Developing and Validating a Measure of Well-Being. Social Indicators Research, 80 (2), 343-360. Sissons, P., & Jones, K. (2012). Lost in transition? The changing labour market and young people not in employment, education or training. London: The Work Foundation. Smith, C., Ferns, S., & Russell, L. (2016). Designing work-integrated learning placements that improve student employability: Six facets of the curriculum that matter. Asia-Pacific Journal of Cooperative Education, 17 (2), 197-211. Smith, C. D., Ferns, S. y Russell, L. (2014). Conceptualising and measuring «employability»- lessons from a national OLT project. In K. Moore, (Ed. ), Work integrated learning: Building capacity (pp. 139-148). Gold Coast, Qld, Australia: Australian Collaborative Education Network. Stevenson, J., & Clegg, S. (2011). Possible selves: students orientating themselves towards the future through extracurricular activity. British Educational Research Journal, 37 (2), 231-246. Stokes, P. J. (2015). Higher Education and Employability: New Models for Integrating Study and Work. Cambridge, MA: Harvard Education Press. Suleman, F. (2016). Employability Skills of Higher Education Graduates: Little Consensus on a Much-discussed Subject. Procedia – Social and Behavioral Sciences, 228, 169-174. Svob, C., Brown, N. R., Reddon, J., Uzer, T., & Lee, R. (2013). The transitional impact scale: Assessing the material and Psychological impact of life transitions. Behavior Research Methods, 46, 448-455. Taveira, M. C. (2013). Promover la empleabilidad profesional en la vida adulta. El papel de los seminarios de gestión personal de la carrera. In P. Figuera (Coord. ), Orientación profesional y transiciones en un mundo global (pp. 161-192). Barcelona: Laertes. Thijssen, J., Van der Heijden, B., & Rocco, T. (2008). Toward the employability link model: current employment transition for future employment perspectives. Human Resource Development Review, 7, 165-183. Tomlinson, M. (2010). Investing in the self: structure, agency and identity in graduates’ employability. Education, Knowledge and Economy, 4 (2), 73-88. Van der Heijde, C. M. (2014). Employability and Self-Regulation in Contemporary Careers. In M. Coetzee (Ed. ), Psycho-social Career Metacapacities (pp. 7-17). London, UK: Springer. Villa, A., & Poblete, M. (2007). Aprendizaje basado en competencias. Una propuesta para la evaluación de las competencias genéricas. Bilbao: Mensajero. Wesselink, R., De Jong, C., & Biemans, H. J. A. (2010). Aspects of competence-based education as footholds to improve the connectivity between learning in school and in the workplace. Vocations and Learning: Studies in Vocational and Professional Education, 3 (1), 19-38. Wilton, N. (2011). Do employability skills really matter in the graduate labour market? Work, Employment and Society, 25 (1), 85-100. Winters, A. (2012). Career learning in vocational education: Guiding conversations for career development. Leuven: KU Leuven. Yorke, M., & Harvey, L. (2005). Graduate attributes and their development. In R. A. Voorhees & L. Harvey (Eds. ), Workforce development and higher education: a strategic role for institutional research (pp. 41-58). (New directions for institutional research; No. 128). San Francisco: Jossey-Bass. Zurita, F., Castro, O. M., Álvarez, J. I., Rodríguez, S., & Pérez, A. J. (2016). Autoconcepto, actividad física y familia: Análisis de un modelo de ecuaciones estructurales. Revista de Psicología del Deporte, 25 (1), 97-104. Pilar Martínez Clares is PhD in education from the Universidad de Murcia. Lecturer in the Department of Educational Research and Diagnosis Methods in the Faculty of Education of Universidad de Murcia. She works on topics related to career guidance and professional training, diagnosis, development, and evaluation of professional competencies, European Higher Education Area, learning focuses, quality, tutoring in education, and entering the workforce. Cristina González Lorente is a PhD student. Predoctoral Resercher on the Training Assistance Programme for University Teachers (FPU) of the Ministry of Education, Culture and Sport in the Department of Educational Research and Diagnosis Methods in the Faculty of Education of Universidad de Murcia. She has also been beneficiary of a research grant in the Support Unit for the General Directorate of Vocational Training at the MECD.